← Live Expectantly. Choose Hope! The apostle Paul said of Faith, Hope and Love, at 1 Corinthians 13:13 in the Bible, that the greatest of the three is Love, which is a synonym for Charity. The King James Version of the bible uses the word Charity instead of Love, but generally Love is used more often. Artists have symbolized these three words. Bands, businesses and babies have been named after them. Popes have written encyclicals about them. And through the ages people have used them to embellish needlework. Faith is symbolized by the Cross of Jesus Christ. An anchor is a symbol of Hope. Not surprisingly, the heart represents Love. 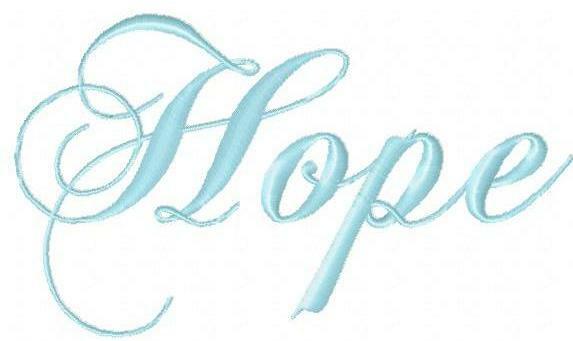 I chose to embroider the three words in shades of blue that appear to represent the word itself. True blue just seems to fit Faith. Pale blue whispers a promise of Hope. Charity’s bold blue color sings loudly of an encompassing Love. If you wish to purchase these designs, please go to the Lettering tab above. This entry was posted in Posts, Something More and tagged 1 Corinthians 13:13, Anchor, Artist, Bible, Blue, Charity, Cross, Faith, Hope, Love, The Three Virtues. Bookmark the permalink. Faith, Hope and Charity – eloquently described. What a nice piece to share with someone who receives a person’s embroidered work.